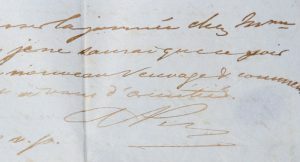 [WINE; TOBACCO; MELBOURNE] Manuscript letter to Édouard Adet, of Curcier & Adet, wine merchants, 1863. 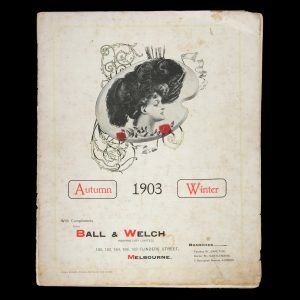 [TRADE CATALOGUE] Autumn / Winter 1903. With compliments from Ball & Welch … Flinders Street, Melbourne. 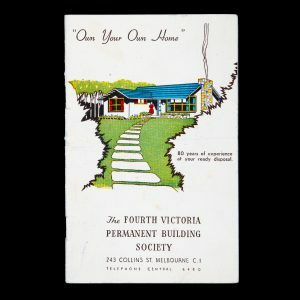 Own your own home : 80 years of experience at your ready disposal /​ The Fourth Victorian Permanent Building Society. Melbourne : Fourth Victorian Permanent Building Society, . 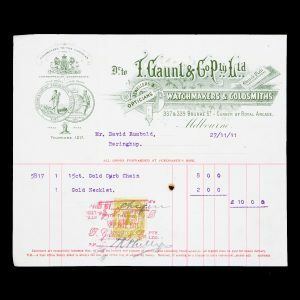 Octavo, pictorial wrappers (horizontal fold, lightly marked), pp 10, plus folding application form at rear (not filled in); original owner’s pencilled financial calculations inside lower wrapper, a clean copy. Copies are recorded in only two Australian collections (Monash University Library; State Library of Victoria). 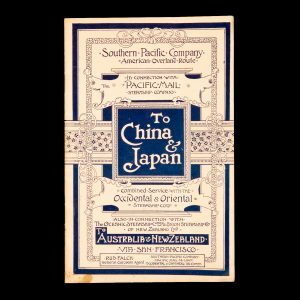 RUDOLPH FALCK; SOUTHERN PACIFIC CO.; PACIFIC MAIL STEAMSHIP CO.; OCCIDENTAL & ORIENTAL STEAMSHIP CO.; OCEANIC STEAMSHIP CO.; UNION STEAMSHIP CO. OF NEW ZEALAND LTD.
To China & Japan … Australia & New Zealand. Via San Francisco. OCCIDENTAL & ORIENTAL STEAMSHIP CO.
1896 / 1897. 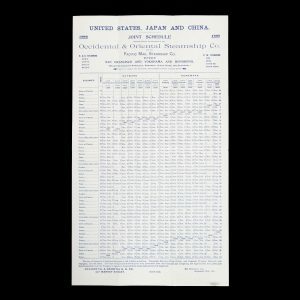 Joint Schedule showing sailing of steamers of the Occidental & Oriental Steamship Co. and the Pacific Mail Steamship Co. between San Francisco and Yokohoma and Hongkong. (Including calls at Honolulu, Nagasaki, Hiogo (Kobe) and Shanghai). At head of sheet: United States, Japan and China. San Francisco : Occidental & Oriental S.S. Co., 421 Market Street, September 26, 1896. Lithographed broadsheet, 400 x 230 mm, printed recto only; original folds, in fine condition. New York : Fleischmann Distilling Corporation, [c.1960]. 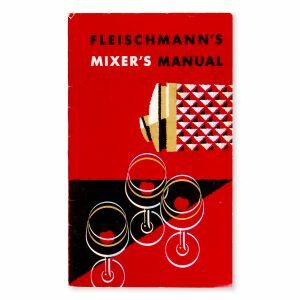 Duodecimo, pictorial wrappers, pp 20, colour illustrations; contains recipes for cocktails (whisky-, gin-, and rum- based) and party punches, and advertisements for Fleischmann’s own spirits products; a few toning spots to the first couple of pages, but a good copy. New York : National Distillers Products Corporation, . 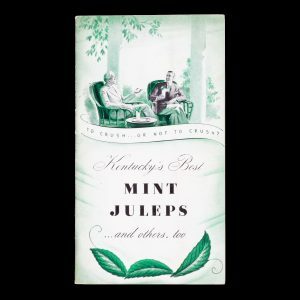 Duodecimo, pictorial wrappers (faint vertical fold line, lower wrapper with a few light marks), pp 28, illustrated; contains recipes for many different variations on the classic mint julep; a good copy. OCLC locates only one copy (University of California, Davis). 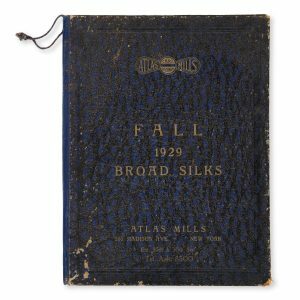 [HAUTE COUTURE FABRIC SAMPLES] Fall 1929 broad silks. Louisville, KY : Brown-Forman Distillers Corporation, Inc., [between 1950 and 1960]. 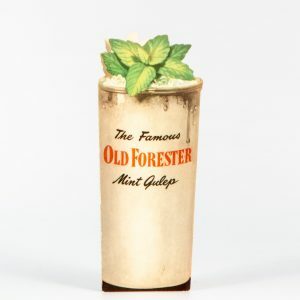 Shaped advertising card, folding to 165 x 70 mm (irregular), identical colour illustration front and back, inside with printed recipe for a mint julep made with Old Forester whisky and monochrome illustration; designed to be free-standing on a bar counter or table; fine condition. 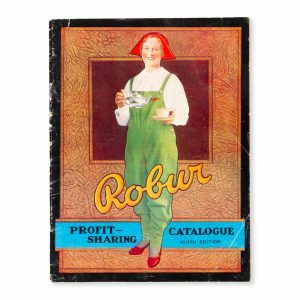 [TEA] Robur profit-sharing catalogue. Ninth edition. 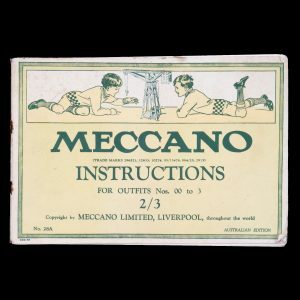 Liverpool : Meccano Limited, . Cover: No. 28A / Australian edition. 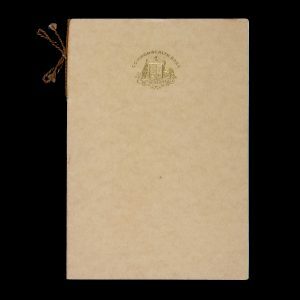 Oblong octavo, pictorial wrappers (detached, lightly foxed), pp 112, illustrated throughout; internally clean and sound. Appears unrecorded in Australian collections. 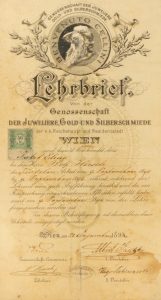 [JUDAICA] Certificate of Apprenticeship of the Guild of Jewellers, Gold- and Silversmiths of Vienna. 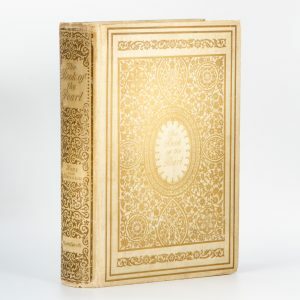 Issued to Jakob Elias (Wolf Hirsch, master), 1894. 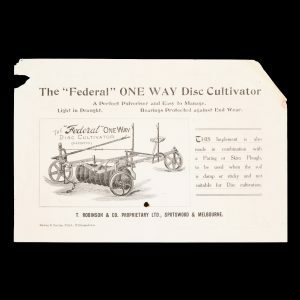 Decorative letterhead of T. Robinson & Co., Spotswood and Melbourne, advertising the “Federal” One Way Disc Cultivator, 1910. Lithographed letterhead, 140 x 208 mm, recto with illustrated advertisement for the “Federal” disc cultivator, verso with receipt of payment of £13/1s/1d from D. Rumbold (farmer, of Baringhup, near Maldon on the Central Goldfields of Victoria) for purchase of this new agricultural implement, “a perfect pulveriser and easy to manage”; corner loss, spike hold, else good.